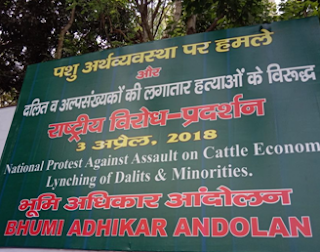 Marking one year of lynching of Pehlu Khan, a dairy farmer, who was attacked on April 3 last year in Alwar, Rajasthan, by a group of 200 cow vigilantes "affiliated" with right-wing Hindutva groups, India's top land rights group, Bhumi Adhikar Andolan (BAA), has revealed that, ever since, over 300 incidents have been reported, where dairy farmers, mainly Dalit and Muslim cattle traders, were harassed. Speaking at a BAA meeting in Delhi, prominent Marxist farmer leader Hannan Mollah said, since none of them has received justice, time has come for the nation to agitate against such "politically motivated murders", adding, "As a democracy, India cannot stand by as innocent farmers, traders and other social minorities are murdered in broad daylight." Another farmers' leader, NK Shukla, stated that repeated attacks on cattle traders and dairy farmers are part of a bigger design to undermine the dairy sector of the country. 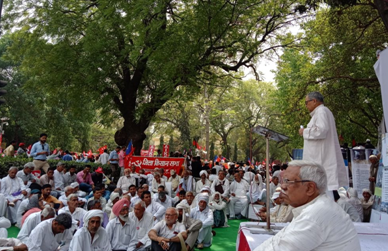 He added, these attacks are creating havoc on the lives of the farmers who are already distressed because they are not getting a fair Minimum Support Price (MSP) for their produce, they are burdened by debts and being pushed to commit suicides. A community leader, Maulana Hanif, said that repeated attacks on Muslims in Mewat is a result of a larger political propaganda, adding, the need of the hour is for all the communities of the region to unite and stand as a strong front against such communal forces. A BAA note said, it is shameful to see that the Rajasthan government has still not made the case of Pehlu Khan, who belonged to the Nooh district of Haryana, and similar other cases, a priority. It has failed to deliver justice to the victims or address the increasing cases of cow vigilantism. "There is a growing threat to the power of democratically elected state government and courts from quasi militant groups such as the cow vigilantes or gau rakshaks, who have undermined the right to life of individuals and communities, especially in the rural agrarian belt", the note said. "Various militant and political outfits such as RSS and Vishwa Hindu Parishad (VHP) have regularly attacked cattle traders under the guise of cow protection. Pehlu Khan’s family is still struggling to come to terms with their loss and live a normal life", the note said. It added, "The delay in this case clearly shows not a lack of evidence, but lack of will to bring the killers to justice. The role of the local police officials in the subduing and diluting of the cases, including threatening families and friends of the victims of filing false cases, destroying evidence and adopting a strategy of false encounters must also be looked into. Demanding justice for these victims, BAA demanded immediate relief to be provided to the families of the victims of these attacks. Condemning the protection given to these gau-rakshaks who have run havoc across the country, and are visibly operating with the patronage of local and state administration and political groups who have vested interests, BAA decided to launch a nation-wide struggle against increasing cases of violence meted by right-wing groups in the name of cow-protection.